Deafened by the whirl of digital advancements happening so fast that all my time went to upgrading both my equipment and brain with programs and drives, that I almost forgot what photography was all about…. 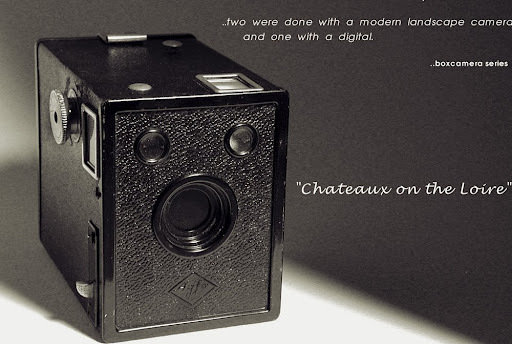 from a top shelf and from inside I heard its voice..a 1932 Agfa box camera called out..(“got $20.00 bucks? buy me)..no programs included. So I did. I took it along a trip to France, the Loire Valley and yes of course I did back myself up with the big guns as well. The Box, takes 120 roll film, remember that? Some form of exercise in patience and the anticipation of seeing images a while after you forgot them only to rediscover the thrill and agony of why did take that. Even at times seeing something you didn’t think it would work only to discover a whole new movement in your work and vision. It gets 8 shots, 6×9 if you can line up the roll correctly at the start. Exposure is simple, press here. I used Tmax 400 most of time and sometimes Tmax100. The small viewer on top and on the side for horizontals darkened by age, appear larger by wearing magnifying glasses on top of my RayBans, a comical sight helping to label me a tourist even further than the photo vest holding my film and back up camera/lenses which I hardly pulled out due to the relaxed fun I was having with the Box. In fact, it made me take pictures once again, not figure out programs. 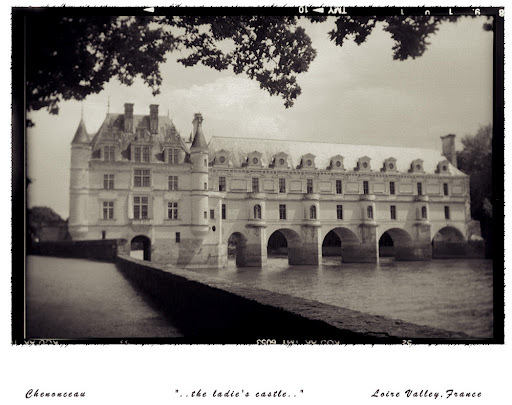 The image here, shot in the rain, is Chenonceau.”The Ladies Castle” something you might not see on This Old House. The soft tones around the edges are the character of this camera, not sure if it is age or if it was the state of the art in its time, but to me,perfect for this look. The exposure,aperture,lens choice…well,who cares,can’t do anything about it anyway, just snap away and hope to correct it later in Photoshop, which brings us to the present. Back at base, scanning these allowed for corrections and at times they were needed other than the usual dust. Toning, burning , dodging, (sound familiar? ) with some negs. was in need but a small price to pay to fall back in love with things again. In a way the old has married the new and a new series begins.